Over 15 years ago, the first generation of Pokemon games arrived. Since then, they have evolved constantly, yet remaining faithful to that original formula. I remember vividly my trip to my local Woolworths store as a 9 year old boy with my brothers, to return to the family car with that large, red cartridge. Pure delight. To this day that memory is so evocative and real to me, it’s clear to see how dear this franchise is to people of my generation. Pokemon X/Y however doesn’t only just delight old fans like myself, it does plenty to bring in a new audience. The game stays true to the winning formula. You’re a young boy or girl; coming of age, ready to go on an adventure. You are told to go and see the local Pokemon Professor; Professor Sycamore. As is the case, he has a selection of 3 Pokemon for you to choose from to start your journey with. 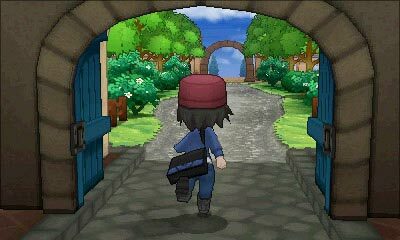 Soon you’ll find yourself leaving the town to begin your journey, along with 4 other hand selected Pokemon trainers, each with their own ideas of what they want to get out of their journey. The story continues along the same path as the many previous generations, guiding you and your new Pokemon from town to town, catching new Pokemon, accruing Gym badges and defeating an evil organisation along the way. In this generation, Team Flare is the enigmatic organisation that is trying to achieve their idealised future of the world. The story follows such a well beaten path, it could feel heavy and derivative. Fortunately however, Team Flare have very little input until quite late into the game and are actually a welcome distraction at that point, praise I could not give Pokemon White/Black’s Team Plasma. Although there’s little to change the winning formula, there are still plenty of changes throughout. Most notably is the new art style. The 2D portaits are gone, and instead we are left with a beautiful 3D style that is so well executed that even the first generation Pokemon feel brand new (even if that means Mr Mime is the creepiest thing ever). Of the first generation, 111 of them have made their way into this latest installment, so there’s plenty there to get your nostalgia going. In total, there’s a whopping 454 Pokemon to catch. With such a huge amount of choice, it never feels like you absolutely MUST have certain Pokemon in your team to succeed. So long as you’re relatively sensible about your type choices, you really can pick your favourites and you’ll be okay for the main story. The new Fairy type doesn’t affect play all that much, and has only been added really to address the wide use of Dragon types in player battles. The difficulty level of the main story of Pokemon X/Y is substantially lower than previous versions. During the main story, I never ‘whited out’ once from losing all of my Pokemon. The argument could be made that, 6 generations in, I probably don’t represent the average player. But the thing that made previous Pokemon games difficult was the constant grinding of levels in the long grass between Gyms. Although Exp. Share in previous games helped to an extent, the new Exp. Share almost completely eliminates any need for grinding. The new Exp. Share is a Key Item that you can toggle on and off and delivers Exp Points to your entire team. Couple that with fast rates of leveling, and the game can feel a bit of a push over at times. Beyond the main game however, there is plenty to do. Since the introduction of breeding back in Gold/Silver, I’ve never felt comfortable enough to even attempt to understand the arcane workings of IVs. But the refinements made to the breeding system in X/Y have made it more accessible and the majority of my time played in the post game has been spent on breeding. It’s by far not at all necessary to do, but it’s compelling and rewarding enough to keep me doing laps around the major city to hatch my eggs. With a couple of extra legendaries to catch, some interesting quest chains, an endless Battle Maison and all of those mega evolution stones to get, breeding certainly isn’t the only thing to do in the post game. You could always Catch ‘Em All. It stands as an extremely well polished RPG, and it would be very difficult for me to not recommend this game. Not only is there enough in the way of new content and quality of life improvements to continue to please long term fans, the entire experience is accessible to newcomers, young and old. Pure delight. Wow, 15 months of no posts, it really has been a long time. Quite a lot has happened to me since I last posted, so I’ll get that out of the way in this post before I do anymore about anything else. I’m now right at the tail end of my final year at university. With only 6 exams to go over the next 4 weeks, I’m very close to being done with university. It’s taken me 3 whole years at university to realise that Computer Science is probably not going to be my future career. I have no idea what I’m going to be doing career wise, but discovering something I will enjoy will be interesting. Despite not enjoying the course completely, I have learnt a lot in other regards over the last 3 years doing this course. I also have started and finished my final year project for this course. We were given a choice of 40 or so possible projects and we had to submit a short list of projects we’d like to do. I was allocated creating a Sudoku Solver. The project started in September and finished in late March. I had to learn a fair amount over that time in order to create a solver that would implement the more advanced solving techniques. I also then ported my solver over to work on Android, another steep learning curve. Although I say I’ve not enjoyed my course, I still enjoy programming when I’m given a specific task. I’m pretty happy with how my project turned out and hope to get a good mark for it. Maybe I’ll go into detail about my program some time. Another thing that’s changed over the last 15 months has been my weight. Anyone that knows me will tell you that this time last year, I was a very porky guy. In July last year I was at 255lbs. Enough was enough and I hit the gym and sorted my diet out. Nearly 10 months later, I’m now 191lbs (a loss of 64lbs) and a lot happier for it. I still have a little way to go (about 20lbs or so I reckon), but exercise is now a fairly large part of my life. This is something that I’ll be posting about for sure. I’m sick of reading articles online about weight loss being an impossible dream, or that you need some miracle product to make it happen. So hopefully my own personal experience and knowledge I have learnt over the last 10 months will in some way help tip the balance towards sensible and sound advice. I’ve also quit playing WoW. WoW was quite a big part of my life, but in September 2010, I stopped playing. I’ve had the odd month back on, but I am no way able to play like I used to. I can’t commit to being able to have 4 nights a week free for 3 hours. I just can’t have that level of commitment to a game anymore. I still however keep in touch with a few of the people from my brilliant guild. If it wasn’t for the people in Inpakt, I doubt I would even have those odd months of re-actived subscription.